We’ve been wedding officiants for all kinds of weddings including many different kinds of Backyard Weddings throughout Southern California. 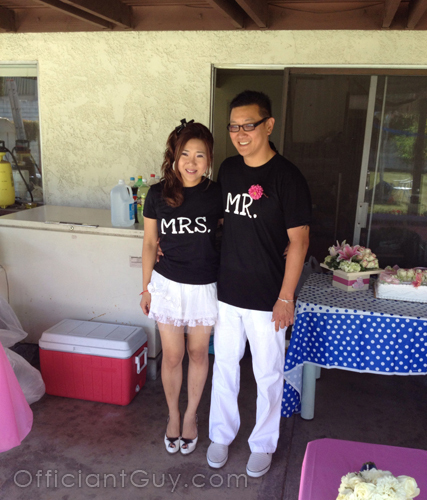 From the elaborate catered wedding affair to the potluck home backyard wedding, Chris has been the wedding officiant at them all over Southern California. Backyard weddings bring the great outdoors to a private event. We love backyard weddings as we get to see other sides of California life. But also, backyard wedding ceremonies can be as intimate as you want them to be. There are so many kinds of backyard wedding ideas. You can get married in privacy and without much ado (just the two of you, or the two of you and your pets, or the two of you and a few friends). Or you can call a wedding caterer and do it up big with a wedding tent and a wedding band (this is helpful if for celebrity weddings especially as the paparazzi helicopters that hover will not see in). If you’re like most people, it’s your closest friends and a joyous experience in a relaxed atmosphere. That’s the beauty of backyard weddings – -it’s up to you and it’s all based on your own wedding style. 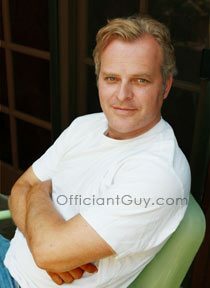 Chris, the Officiant Guy, has been the officiant for couples who want a simple ceremony with no guests in their home. Southern California’s incredible weather makes a backyard wedding feasible almost year round. And the great thing is that on one of those few bad weather days you can get m arried inside your own house. It’s the ultimate relaxed environment. Don’t forget that Officiant Guy is specially authorized by the County Clerk’s Office to issue you a California confidential marriage license so you never have to leave home. How easy is that? 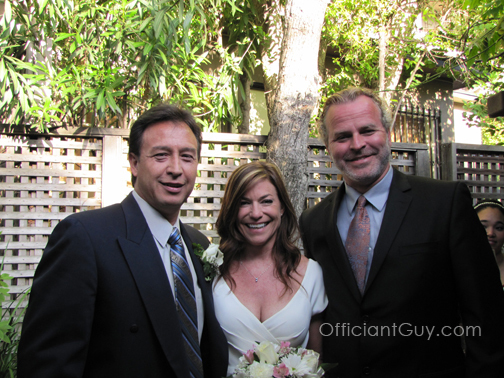 Chris Robinson has been one of the top officiants for Southern California weddings. 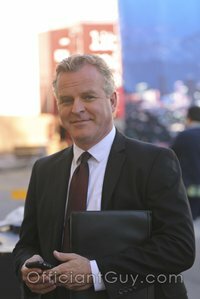 Chris is available in a periphery around Los Angeles, from Orange County to Santa Barbara County to Riverside County. So if you are looking for a wedding minister or officiants in Southern California give Chris a call today. Chris Robinson is a California minister for a wedding. He has been officiating weddings and issuing confidential wedding licenses for over dozens of years. If you wish to get married in California give the most popular officiant in Los Angeles County a telephone call at (310) 882-5039 or (562) 547-3255 or fill out the contact form.